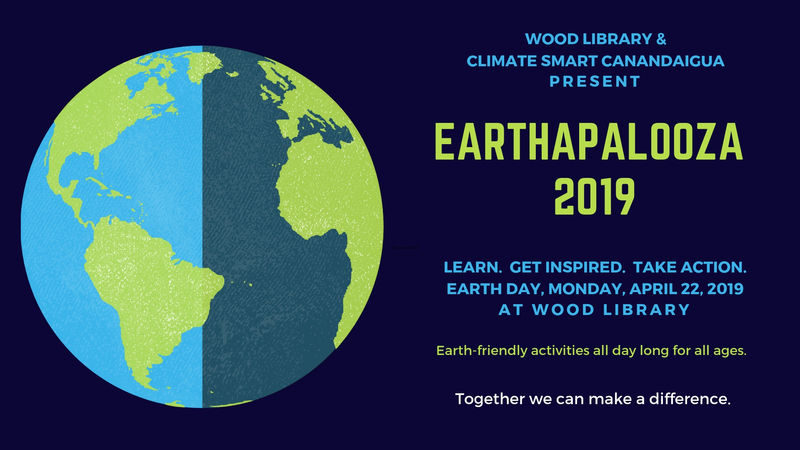 CANANDAIGUA, NY — Wood Library and the City of Canandaigua’s Climate Smart Canandaigua (CSC) will host Earthapalooza on Earth Day, Monday, April 22, 2019 at Wood Library. This all-ages event is free and open to the public. Earthapalooza is designed to raise awareness of environmental issues and educate the community on actions they can take to help reverse climate change, with a focus on waste management and food waste diversion. Connect and learn from community organizations that are focused on a more sustainable future. Learn how to divert waste from the landfill, how to compost, what to recycle, and how “stuff” can be reused. Join the Citizens Climate Lobby and take a pledge to practice lake-friendly lawn care. Learn how to conserve water with a rain barrel. Get your bike fixed at our “fix-it station”. Check out our electric vehicle demo. Donate gently used books, purses, eyeglasses, toner cartridges, shoes and boots, coats, and backpacks, and plastic bags for reuse! Community partners include: Canandaigua Lake Watershed Association, Citizens Climate Lobby, City of Canandaigua, Climate Smart Canandaigua, Cornell Cooperative Extension, Dream Bikes, Finger Lakes Biochar, Finger Lakes Land Trust, Girl Scouts, Habitat Restore, Impact Earth, Lions Club, North Face, Ontario County Soil and Water Conservation District, Ontario County Department of Sustainability and Solid Waste Management, Town of Canandaigua, Wegmans Food Markets. All ages. Bottle cap art. Create a planter from a plastic bottle. Magazine art collages. Seed bombs. For ages 3-5. Dr. Seuss’ beloved character The Lorax warns against mindless progress and the dangers to the Earth’s natural beauty. A special Earth Day program of stories, crafts, and games. Registration requested. Drawdown by Paul Hawken is the most comprehensive plan ever proposed to reverse global warming. The New York Times Bestseller is the focus of this discussion. Join readers from around New York State to discuss the most substantive solutions to slow climate change. Discussion will be led by Maria Bucci, Wood Library’s Green Team Leader and member of Climate Smart Canandaigua. This award-winning documentary (2015) tells the story of the Recycled Orchestra of Cateura, a Paraguayan children’s musical group who perform using musical instruments made from materials found in a nearby landfill. Celebrating 160 years of service, Wood Library, located at 134 N Main St, Canandaigua, is a full-service community library and registered charitable organization serving everyone who resides in the Canandaigua City School District. Its mission is to provide exceptional public library service in a comfortable and safe environment where people can satisfy their curiosity, stimulate their imaginations, and connect to the local community and to the world. Wood Library is committed to promoting environmental stewardship at all levels of the organization and in the community. For information call 585-394-1381 or go to woodlibrary.org. The Climate Smart Canandaigua (CSC) task force was created by the City of Canandaigua in January 2019 to engage the community in addressing the climate change crisis. Comprised of City of Canandaigua residents, the CSC’s goals are to Provide ongoing implementation of actions related to climate change and increase efforts to reduce our carbon footprint and achieve cost savings in the process; assess baseline conditions, establish goals and develop plans and suggest policies to achieve goals; and educate the community and stakeholders on the value of the goals and plans. For more information, visit canandaiguanewyork.gov/csc.